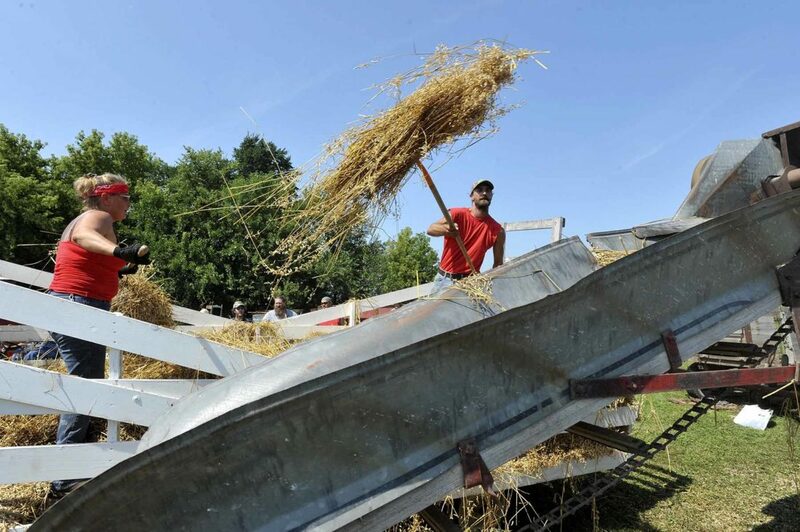 April Patten, at left, along with Sean Collette, both of Odgen, feed the antique threshing machine Saturday afternoon at the West Central Region Cockshutt & Co-op Club Homer Threshing Bee in Homer. Tim Berven, of Stanhope, parks a for sale Farmall tractor he was taking for a test drive Saturday at the West Central Region Cockshutt & Co-op Club Homer Threshing Bee in Homer. David Carlson, of Otho, watches the threshing crew from the sidelines Saturday afternoon at the West Central Region Cockshutt & Co-op Club Homer Threshing Bee in Homer. 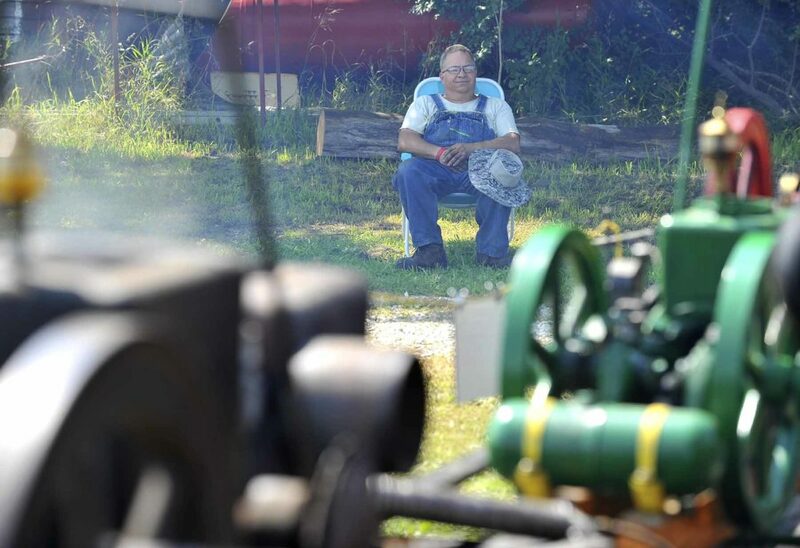 Keith Stuhrenberg, of Barnum, watches as most of his collection of 11 hit’n’miss engines continue to run Saturday afternoon at the West Central Region Cockshutt & Co-op Club Homer Threshing Bee in Homer. 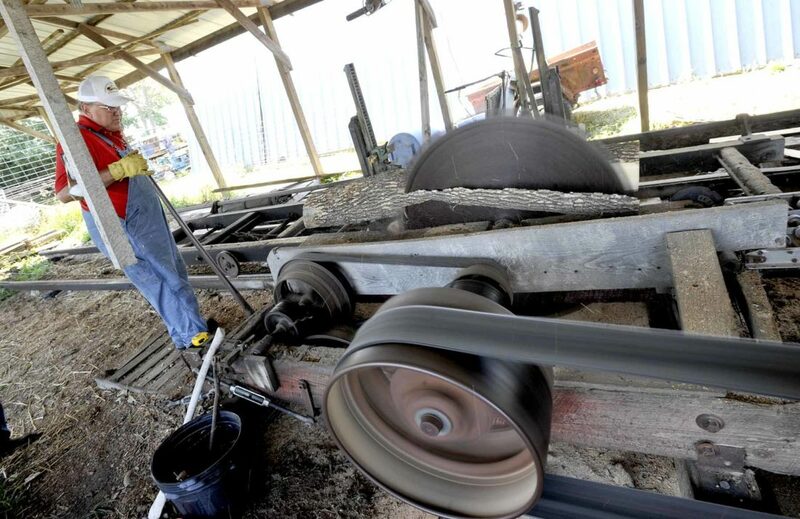 Ty Murray, of Stratford, works on creating a steel cobra Saturday afternoon at the West Central Region Cockshutt & Co-op Club Homer Threshing Bee in Homer. Murray spent the day demonstrating his skills for visitors. Don Lamb, of Homer, helps operate the West Central Region Cockshutt & Co-op Club’s sawmill during the Homer Threshing Bee. The lever he’s holding controls the width of the cut by moving the log towards the blade. Members of the West Central Region Cockshutt & Co-op Club have an operating sawmill that they demonstrate every year at the Homer Threshing Bee in Homer. 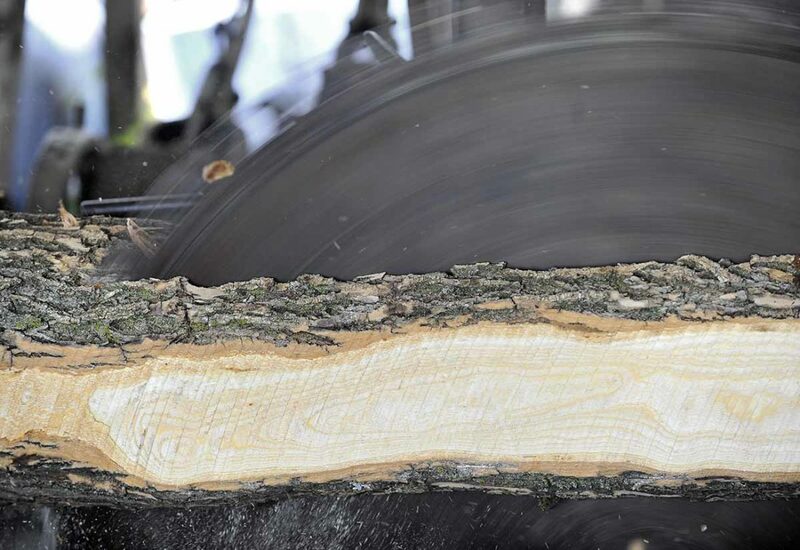 The four foot diameter blade makes quick work of creating dimensional lumber from hole logs and is powered by a nearby tractor. 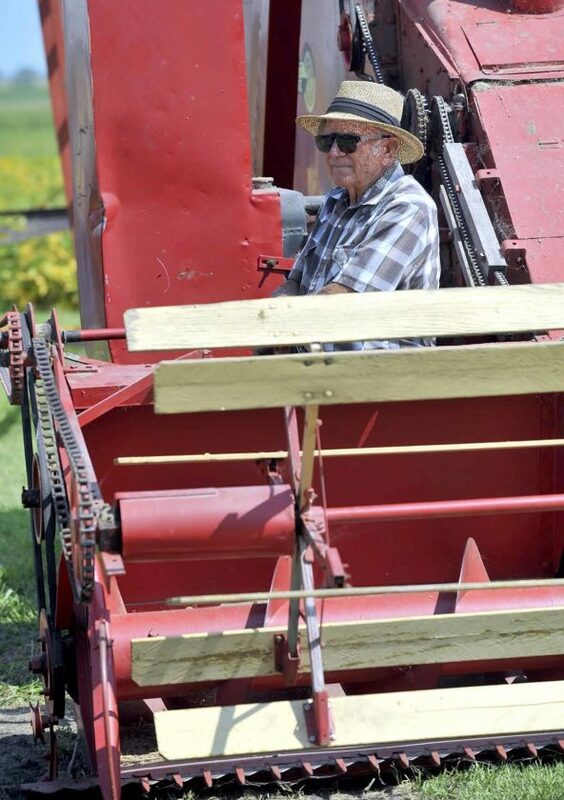 HOMER — David Carlson, of Otho, was standing next to a piece of antique farm equipment Saturday afternoon at the West Central Region Cockshutt & Co-op Club Threshing Bee watching April Patten and Sean Collette, both of Ogden, pitching freshly harvested wheat into an old threshing machine. 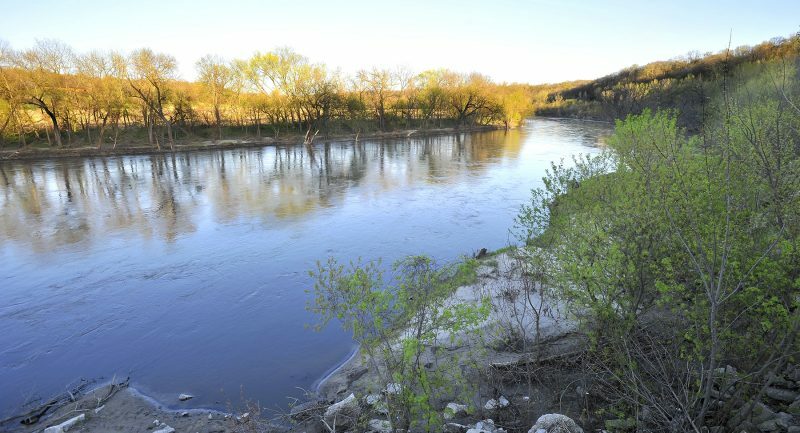 They were both soaked in sweat that glistened in the hot sun as bits of dust, straw and grain rained down on them. The itchy stuff stuck to them like glue. Carlson is no stranger to standing on a wagon pitching hay into a threshing machine. It was common in his youth. That applies to the dust, the heat and the noise. But wait, it can get worse. Tim Berven, of Stanhope, took the opportunity to do a little shopping; he took an old Farmall that was for sale for a test spin around the grounds. He was almost sold on it. “I’m giving it some thought,” he said. His assessment after the test drive? Of course, buying a used tractor involves a bit of friendly negotiation with the seller. Berven was looking forward to haggling over the asking price. 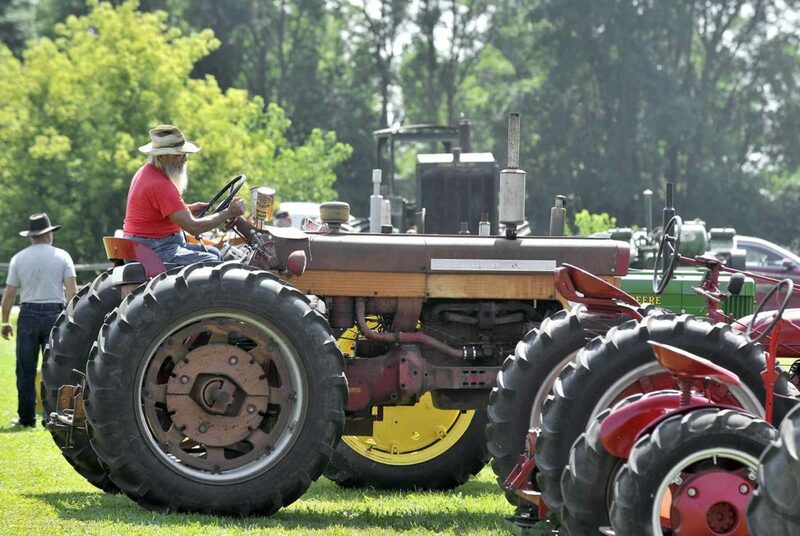 Keith Stuhrenberg, of Barnum, brought 11 of the many old engines he owns to the threshing bee. He enjoyed something rare and unusual for a collector of the machines often called hit-n-miss engines. The names come from their tendency to not fire on every revolution, and it’s hit or miss whether they even run. Stuhrenberg enjoyed his moment of joy in a lawn chair in the shade, even if it didn’t last as long as he might have liked. Not long afterwards, there were only nine engines running. He’d take care of it later. One of the more unusual “engines” on display at the threshing bee was an antique log splitter that’s been in John Bonner’s family for four or five generations. Also on display was a log split in four with the black powder-powered device. The device, which looks like a pointed length of pipe, is loaded with about 400 grains of black powder, then it’s driven into the log open end first. The fuse is lit and, kaboom! the force of the resulting explosion splits the log. The splitter is then reloaded for the next log. Another log or a big piece of metal keeps the device from flying off over the horizon when it goes off. Bonner managed to use the device without incident. “Look,” he said before proudly showing that he indeed does still have all 10 of his fingers. During his experimental log splitting, Bonner stayed true to the heritage of the splitter when he needed material to pack into the tube to serve as a wad. An art that predates every piece of equipment was also on display. 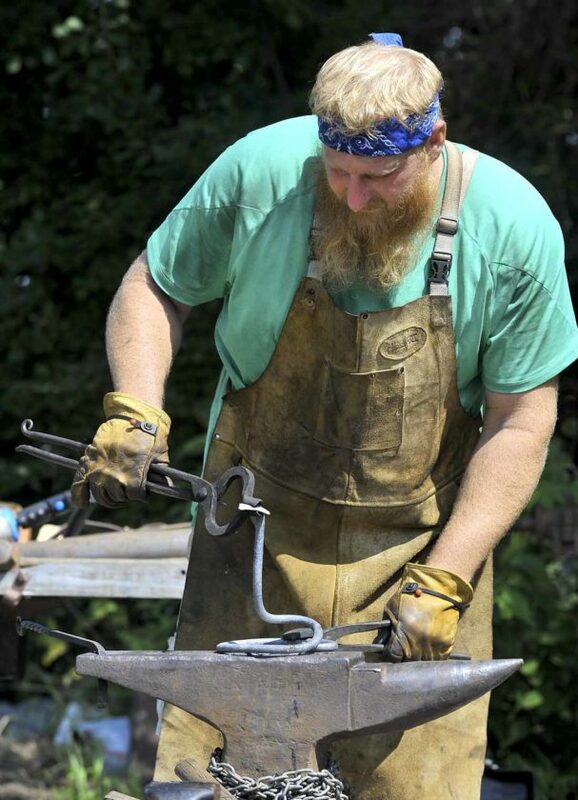 Ty Murray, of Stratford, had set up his forge and was demonstrating his blacksmithing skills and trying something new. Visitors could also watch the production of sawn lumber. The club has a sawmill on the grounds and several members were staying busy turning seasoned logs into dimensional lumber. Powered by one of the old tractors, its 4-foot blade makes quick work of it.